Axne surveying damage in Fremont County, just outside of Hamburg. Iowa’s third district Congresswoman Cindy Axne sent a letter to congressional leaders today, urging “immediate action” on disaster relief. Earlier this week, Democrats in the U.S. Senate blocked a vote on a disaster aid package as they seek more money for hurricane victims in Puerto Rico. Axne said congress must respond to the requests from local and state officials who are directly dealing with this spring’s flooding. Axne will be in three western Iowa counties tomorrow. 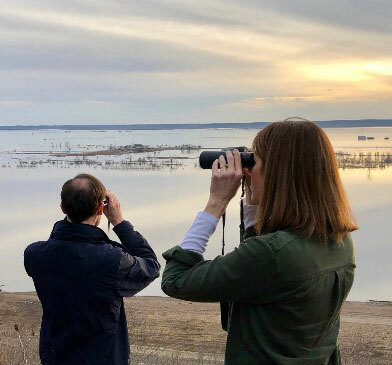 “We’ll be working with emergency management again, local election officials, stopping by shelters and visiting farms that have been under water,” Axne said of her stops in Mills, Fremont and Pottawattamie Counties. Axne has joined the effort trying to expand USDA crop insurance for crops damaged in the field to also cover grain that’s been harvested and sitting in storage bins. Much of that grain in Mills and Fremont Counties has been spoiled by the flooding. Axne said during her trip to the flood zone last week she spent time with a 17-year-old in a shelter who fled his home with nothing more than the clothes he was wearing.